While God may give us more than we can handle. The truth is he never gives us more than he can handle! However, when pray we can no longer help ourselves and turn to Jehovah Jireh (the LORD who provides) to do what we are unable to do we subject ourselves to his ministry not our abilities Isaiah picks up where Paul’s letter to the Philippians leaves off. “Turn to the LORD! He can still be found. Call out to God! He is near. Give up your crooked ways and your evil thoughts. Return to the LORD our God. He will be merciful and forgive your sins. The LORD says: “My thoughts and my ways are not like yours. Just as the heavens are higher than the earth, my thoughts and my ways are higher than yours.” (Isaiah 55:6-9 CEV) And when we put that together with the fact that God doesn’t work by a time schedule we find ourselves when God puts us in over our heads sitting in the divine waiting room. 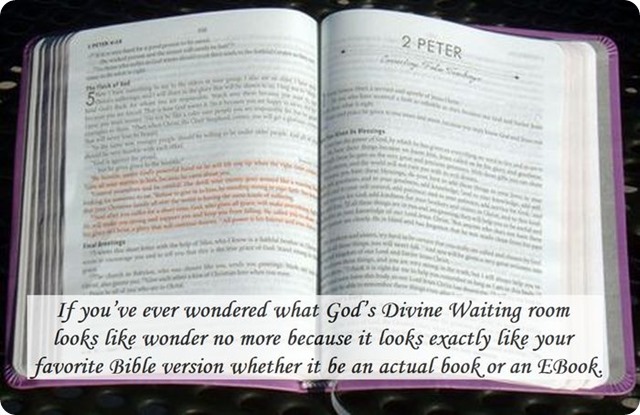 If you’ve ever wondered what God’s Divine Waiting room looks like wonder no more because it looks exactly like your favorite Bible version whether it be an actual book or an EBook. So open the door, step in, make yourself at home, and dine on a menu of faith, hope, patience, love, and joy.